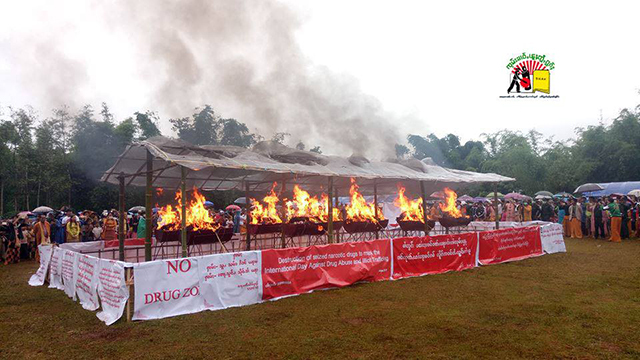 Two ethnic Shan armies, the Restoration Council of Shan State/Shan State Army (RCSS/SSA) and the Shan State Progress Party/Shan State Army (SSPP/SSA), held separate ceremonies on Monday to mark the UN’s International Day Against Drug Abuse and Illicit Trafficking. The SSPP/SSA held an event at its headquarters, Wan Hai, in southern Shan State’s Kesi Township, while the RCSS/SSA convened at its headquarters in Loi Tai Leng, Mongpan Township, close to the Thai-Burmese border. The announcer added that since 2015, the armed group had arrested 114 drug users. The SSPP/SSA said that its narcotic-clearance work had been hampered due to armed conflict in the region. The RCSS/SSA declared that it had seized 223,035 methamphetamine pills, 19.63 kilograms of opium and 14.54 kg of heroin, and arrested 557 drugs users and dealers during the past one-year period. Other ethnic armed groups in Shan State, including the United Wa State Army (UWSA), one of the strongest armed groups in Burma, held drug-burning ceremonies. The UWSA staged an event in Mong Bok, while the National Democratic Alliance Army (NDAA) held an incineration ceremony in Mongla Township. 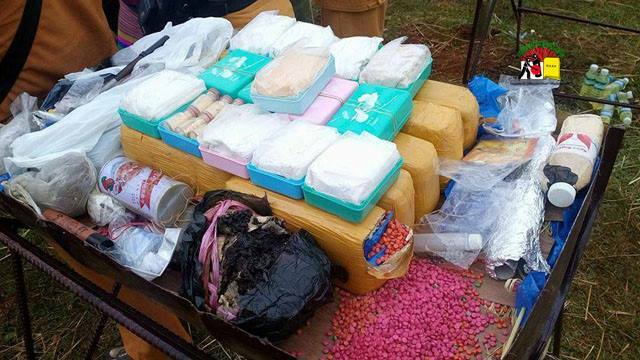 The Ta’ang National Liberation Army (TNLA) said it also conducted a drug-burning activity. According to the United Nations Office on Drugs and Crime (UNODC), Burma is the world's second largest producer of opium, after Afghanistan. Shan State is said to be the largest opium producer in Burma.